Publisher: Discovery Channel Multimedia, Interplay Entertainment Corp.
Share your gamer memories, help others to run the game or comment anything you′d like. 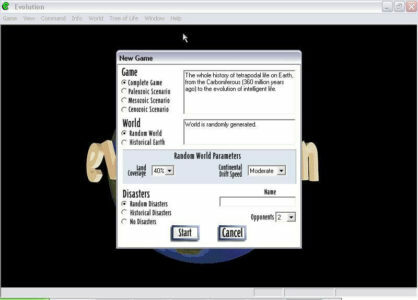 If you have trouble to run Evolution: The Game of Intelligent Life (Windows) first! To all those who have issues running this game, Windows 95 games can be run but you probably need a virtual machin for it. Wow they are really helping to fix or issues… Hey if a game dosnt even work dont freaking post it. i cant install the game cause "Evolution requires Windows 95" and mi computer has Windows 7. How can i run it? How the heck I can play it on windows 10? every single time i try to make a new game it crashes. I downloaded and unzipped the files, but when I try to run the game it says I need the Evolution disc in my disc drive. Windows 10. What should I do? I′m pretty sure I got it to work not much more than a year ago, but now I can′t get it to work. Windows 10. Tried all kinds of compatibility settings. Someone got it to work and want′s to share?